The pantelegraph (named by combining the words “pantograph” and “telegraph”) is considered the precursor to the modern day fax machine. Using electrochemistry, images were sent via a pantelegraph in one area, and reproduced by a telegraph in another area. The device stood about 2 meters high and was shaped much like an old mathematician’s or architect’s compass. In order to use it, one would write their message on a sheet made of tin using a form of non-conducting ink. Once finished, the operator would secure the tin sheet to a curved metal plate and begin transmission. The stylus “scanned” the text by moving across the tin sheet, and sent a signal to a telegraph which created the message in ink on paper soaked in potassium ferrocyanide. One of the biggest problems with the early design for the pantelegraph was keeping the machines in synch with each other. The problem was corrected by using a pendulum and a regulating clock in order to break the magnetic connection as well as keep the connection with the stylus as needed. Giovanni Caselli, the man behind the invention, is credited with sending the first “fax” across France using this method. Caselli, an Italian physics professor, was born in 1815 and taught at the University of Florence. While there, he began researching the telegraph and working on ways to send images using this technology. By 1856, Caselli had enough positive results to impress the Grand Duke of Tuscany. Shortly after, Caselli traveled to Paris to work with famed inventor Paul Gustave Froment. 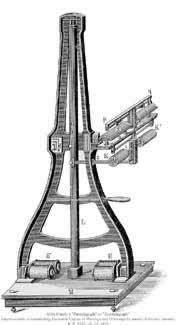 With his help, Caselli built the first working pantelegraph in the 1860’s. The new technology gained a fury of interest, and caught the attention of Napoleon III who visited him in order to get a full demonstration. A year later, King Victor-Emmanuel had Caselli bring his machines to several highly successful demonstrations at the Exhibition in Florence. Thanks to this, Caselli was given the authority to conduct a second experiment to run a line between London and Liverpool. His device ended up being so popular that over 5,000 messages were sent in the first year alone. All the popularity was not to last, however, and eventually demand for the pantelegraph plummeted. Many found the writing barely readable. In addition, the Pantelegraph Society, which had been created to deal with the demand for the machines, did not do any form of promotion. They believed the item would speak for itself, and therefore were not able to meet the demands of the emerging market. The final nail in the coffin came from the public’s unwillingness to use the machine to its full potential. For the most part, the only industry to truly make use of the pantelegraph was the banking industry, which used it to verify signatures on bank deposits. Therefore, in 1884 Caselli negotiated a contract with the Chinese Empire to take over experiments with the pantelegraph in Peking. While China did not follow through with these experiments, Japan later did. This is why much of modern faxing is considered to be owed to the Japanese. Get Free Quotes on Scanning Services Near You Today! Record Nations provides premier scanning services across the nation. Our professionals have been hard at work for years and know the best practices of the industry. For help on your next scanning project, call us today at (866) 385-3706 or fill out the form on the right for free quotes! Giovanni Caselli: A full history of Giovanni Caselli, including his invention of the pantelegraph, his involvement in the first facsimile sent, and his offer for honorary French citizenship by Napoleon. Mid Nineteenth Century Electrochemistry: An in depth look at the leading inventors behind the major leaps in electrochemistry during the 1800’s. Brief History of Imaging Technology (PDF): A guide to the history of imaging technology from the first pinhole lens in 1021 to modern day scanners, fax machines, and cameras. The Pantelegraph: A news article from the Sidney Morning Herald from May of 1865 promoting the pantelegraph and explaining its importance to the reader. Old Technologies Never Die, They Just Don’t Get Updated (PDF): A paper that covers how technology rapidly changes, focusing on facsimile transmission.